The dominating forest landscape in the Ifrane Model Forest is the Middle Atlas cedar forest, which extends over 114,500 ha and represents 85% of the cedar surface area in Morocco. The cedar forests are threatened by a combination of two phenomena: cedar dieback and resource degradation. Resource degradation is essentially due to the excessive harvesting of forage resources and firewood by a continuously growing population, perpetuating a survival economy. As for cedar dieback, it is closely correlated to water stress. Accentuated by recurring droughts over the last few years, it could worsen with the possible impact of climate change. Water stress is also worsened by the state of resource degradation. The Model Forest offers an organized and expanded framework for dialogue and action, allowing the population, forest administration and local stakeholders to develop new relations and to take action for the sustainable development of their territory, the preservation of the cedar forests and the improvement of their living conditions. The Model Forest territory is that of the Province of Ifrane, which is distinguished by a mountainous landscape, with an altitude gradient ranging from the low hills in the Northwest to the high summits in the Southeast with the highest point in Jbel Hyan at 2,409 m. The dominant forest landscape is the Middle Atlas cedar forests, which extends over 114,500 ha. The forest centre of the territory corresponds to the perimeter of Ifrane National Park, which represents nearly 33% of the province’s total surface area. The Middle Atlas contribution to water mobilization in Morocco is critical, as the basins that are fed by it provide more than 80% of the country’s mobilizable water. The waterways in the Province of Ifrane are distributed into two basins: the Sebou Basin and the Oum er Rbia Basin. The province’s main economic activities are linked to agriculture, animal production, forestry, tourism, industry and handcrafts. Animal production is dominated by sheep production, including the famous Timahdite breed, known for the quality of its meat: it is the main economic resource for rural inhabitants. In agriculture, apart from grains, fruit production plays a very important role (apples, pears, peaches, cherries and prunes, essentially). The forestry industry is important, although essentially limited to sawmill activities. The forest also provides other important resources for rural users who harvest dead wood for heating, as well as non-timber forest products, some of which have real economic value, such as lichen, harvested and exported for use in the manufacturing of beauty products. This province has important assets for tourism development, given the wealth of its natural, landscape and cultural heritage. The industrial sector is still in the embryonic stage, dominated by very small businesses, mostly in the agri-food sector. Handcrafts (focused mainly on wood working, weaving and embroidery) occupies an important place in the province’s economic activities. The province’s population is composed of three major tribes: Bni-Mguild, Bni-M’tir and Ait Seghrouchen, broken down into some 15 subgroups in total. The poverty rate in the province is 31.1%, much higher than the national average of 22%. It is even higher in rural areas where the rate is very high in certain communes. Research and education institutions (Rabat-Salé National Forestry School of Engineers, The Ifrane Al Akhaouyen University and the Meknès Moulay Ismail University). 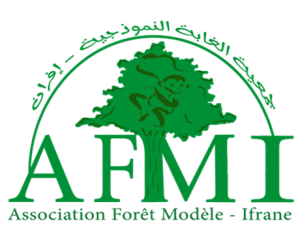 As an organization, Ifrane Model Forest is a member of the NGOs working group on Climate Change. Education and awareness-raising among the local stakeholders regarding the environment and sustainable development. Development of solar-powered water heaters in mosques as an alternative to firewood. Improved health and working conditions for rural women.